Home > Google News > Google SEO > Google's Cutts: Nofollow Links In Advertorials Or Else! 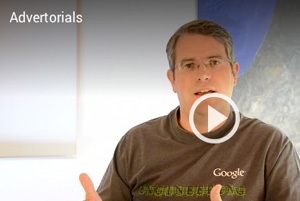 Yesterday, Google's head of search spam, Matt Cutts posted a video on Google's stance on using advertorials in a way to manipulate Google's search results. As you can imagine, if you use advertorials and those advertorials have links to your web site - you must nofollow them or Google can take action against your web site. I covered this in more detail over at Search Engine Land. There are folks saying, well - what about video content? Product placement. Do those have to be disclosed for users? I assume Matt would say yes. But product placement in videos do not manipulate Google's algorithms, at least not yet. Previous story: How Do You Uncover Your Spammy Links?